*Data taken from official FBLA website on 3/22/2013. 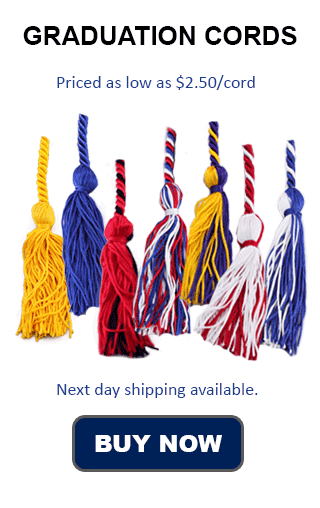 Compare FBLA Graduation Cords to our Graduation Honor Cords and see how you can save! Honors Graduation offers students are Blue and Gold. More specifically they are royal blue and gold double graduation cords. Royal blue and gold honor cords from Honors Graduation are of the best quality. Plus, compared with honor cords available from many of our competitors websites, our honor cords have the highest quality and the lowest prices! We even include 4-6 day shipping for a low flat rate of only $4.00, and incredible bulk rates, so no matter how many cords you need, you know you're getting an amazing deal. Wearing these on graduation day or receiving these at an awards banquet or senior night will be a great honor, and something to remember for years to come. Career and technical student organizations are present at both the high school and the college level, with hundreds of thousands of active members in the United States alone. Many students of groups or chapters of these organizations sections will be eligible to wear the Royal and Blue Honor Cord on graduation day, whether it be from university, college, or high school.